Rheingold. This promises to be a wonderful Ring, as Valery Gergiev unfolded the music beautifully in this first opera, never rushing, but never flagging. He even held the first chord for longer than usual, but with excellent effect. George Tsypin’s powerful designs showed four giant horizontal human torsos that moved up and down at various times. With fine costumes and Gleb Filshtinsky’s excellent atmospheric lighting this was a very welcome change from the two operas I saw in Bayreuth at the weekend! I particularly liked the costumes for the giants, and the use of dancers in raising the huge silk representing the river. As to the singers, Nikolai Putilin was superb as Alberich, and was the star of the evening — I’m delighted he will appear again in the last two operas. This is not the case with all performers, and Evgeny Nikitin, who was a slightly underpowered Wotan, will reappear in Siegfried, but someone else will take over in Walküre. Fricka was well sung by Larisssa Diadkova, as were her brothers Donner and Froh by Evgeny Ulanov and Evgeny Akimov, with Zhanna Dombrovskaya as Freia, and Oleg Balachov as a strong Loge. When Donner roared out his last words Weise der Brücke den Weg it sounded like Russian, but that was fine with me because the cast were all entirely in character. Vadim Kravets was a beautifully voiced Fasolt, with Gennady Bezzubenkov as a surly Fafner, whom we shall see again in Siegfried, along with Zlata Bulycheva as a darkly voiced Erda. Andrei Popov sang Mime, but the part will be sung by someone else in Siegfried. Altogether this was a great start to the Ring, though standards slipped in Walküre the next night. Walküre. The first act was disappointing with Avgust Amonov as an underpowered Siegmund, who gave the impression he didn’t understand the German he was singing, and Keiner ging—doch Einer kam followed by Winterstürme lacked emotional force. 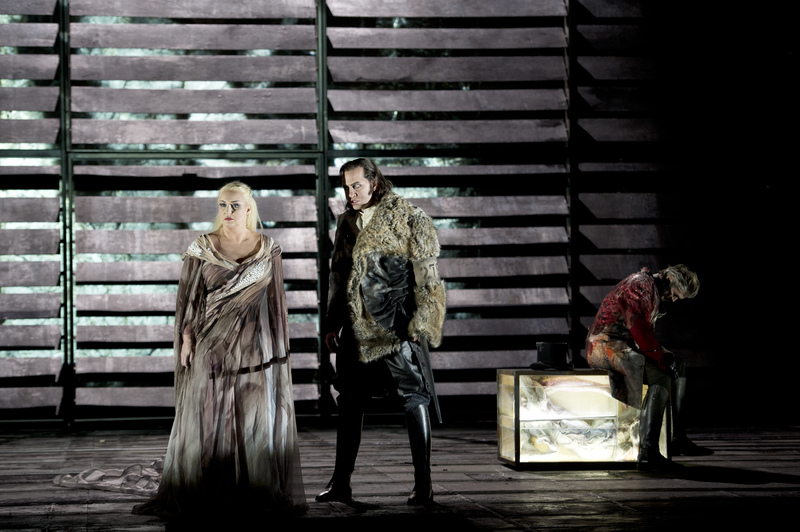 Gennady Bezzubenkov as Hunding, following his appearance as Fafner the night before, carried more power. 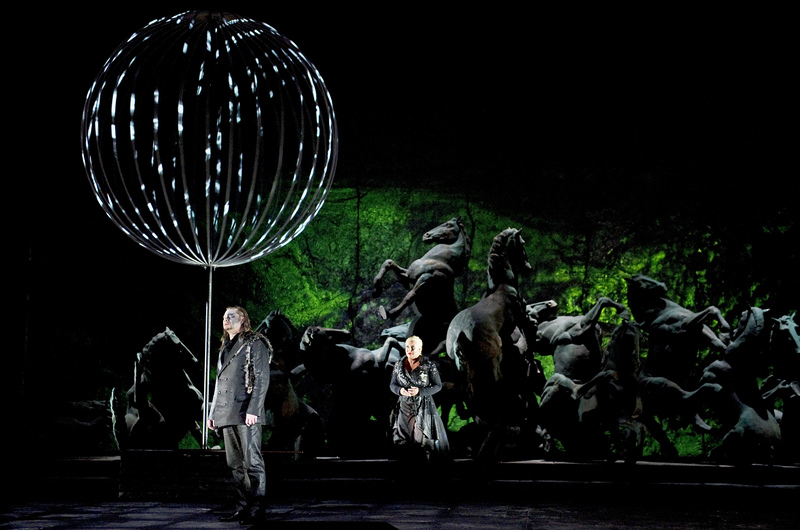 Mlada Khudoley as Sieglinde was stronger than Siegmund, but again she couldn’t hit the heights. Her response to Brünnhilde’s annunciation in Act III with Rette mich Kühne was without impact. The best moments were the duets between Wotan and Fricka in Act II, and Wotan and Brünnhilde in Act III. The Wotan was not the same as last night — and the eye patch was changed from right to left eye — but though Mikhail Kit showed warmth in his voice, he lacked the strength of other Wotans I’ve seen recently, such as Tomlinson and Terfel. As Fricka, Larissa Diadkova was superb, with wonderful stage presence and complete command of the part — she was the best Fricka that I remember seeing. 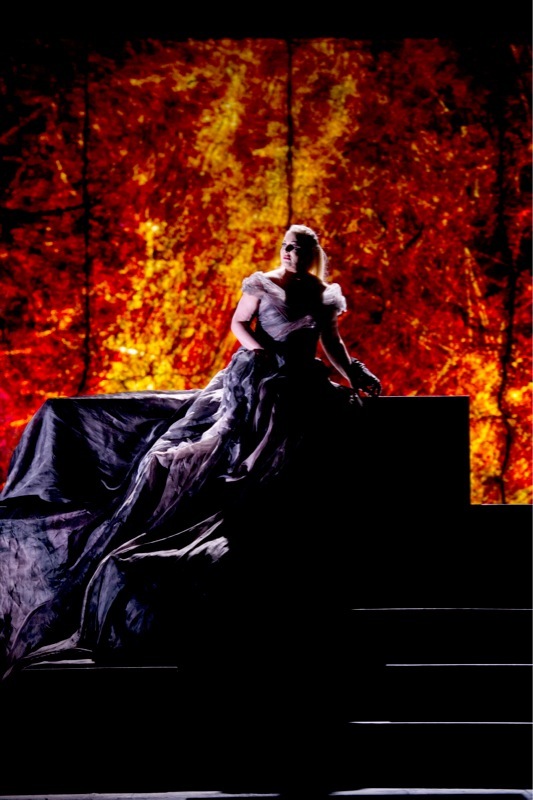 As Brünnhilde, Olga Savova was a powerful presence, commanding in her appearance to Siegmund Nur Todgeweihten taugt mein Anblick, appalled by Wotan’s revenge War es so schmählich, and convincing in persuading him to protect her by fire. Gergiev conducted with restraint and emotional support for the singers, never drowning them, and I felt that with stronger principals in Act I he would have let the orchestra leap forth with greater effect. The Russian brass and percussion were superb, and this is where a Russian conductor is so important. The production included four human torsos again, but bent at the waist, and the costumes were effective, particularly the Valkyries holding shields, like wings, in their right hands. Only the sword was a disappointment, with its battery-powered light in the handle, like a child’s toy — really naff (not available for fighting). I hope Siegfried forges it into something more worthy! Siegfried. This was a more rewarding experience than Walküre, mainly because Leonid Zakhozhaev sang an excellent Siegfried, wielding the sword like a real weapon, and Evgeny Nikitin sang out well as Wotan, much better, I thought, than his appearance in Rheingold — the patch, by the way, was back on the right eye. Nikolai Putilin sang wonderfully as Alberich again, and Erda and Fafner were the same as in Rheingold, though Fafner’s voice as the dragon was amplified, which I didn’t care for at all. Mime this time was Vasily Gorshkov, who played and sang the part very well, and Anastasia Kalagina was a lovely woodbird. My only complaint on the singing was Olga Sergeyeva who took over as Brünnhilde, but whose voice had too much vibrato, and seemed out of pitch in the awakening duet with Siegfried. The orchestra played very well again under Gergiev who seems to be able to draw on immense reservoirs of emotion. Staging and lighting were fine as far as I was concerned, except that when Brünnhilde climbed onto the rock, where she is supposed to have been sleeping for a generation, the lighting was bright and only went dark after she lay down. If she was moving to a musical cue, then it was a lighting fault, but I rather suspect she was to blame, indicating that the whole thing was under-rehearsed. Now we await yet a third Brünnhilde in the final opera. Götterdämmerung. Musically this was on a par with the others, and vocally it had some wonderful singers and lovely moments, but there were serious shortcomings, notably boule de suif Larisa Gogolevskaya as an unsuitable Brünnhilde, who simply didn’t have the voice for the part. Viktor Lutsyuk as Siegfried lacked voice control and was not as good as Leonid Zakhozhaev yesterday. But Nikolai Putilin was an excellent Alberich, as before, and Mikhail Petrenko a very fine Hagen. His half siblings Gunther and Gutrune were brilliantly sung by Evgeny Nikitin and Elena Nebera. Nikitin, who was Wotan in both Rheingold and Siegfried, was the best Gunther I ever remember seeing. In fact he and Hagen made me think immediately of British politicians Gordon Brown and Peter Mandelson. Elena Nebera had a lovely voice and her acting was terrific. She moved like a ballerina with arms, head and body — I was impressed before she ever sang a note. 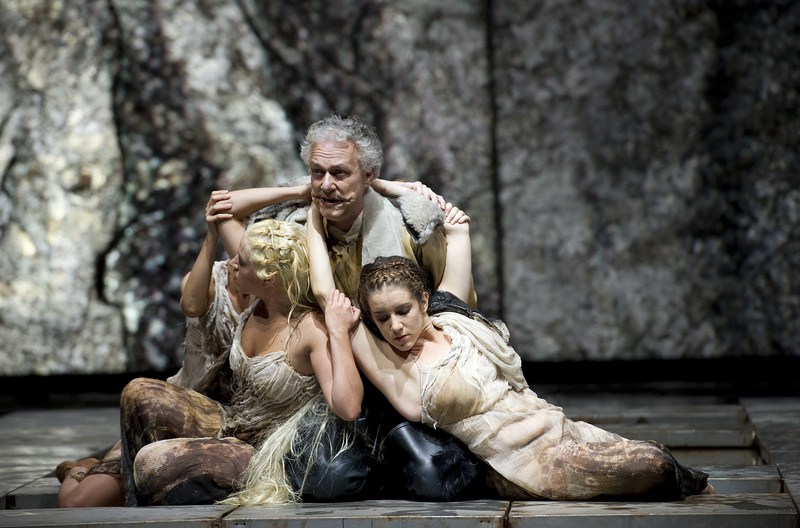 Petrenko, Nikitin and Nebera formed a wonderful trio as Hagen, Gunther and Gutrune, and their scenes, along with the encounter between Alberich and Hagen at the start of Act II, were the highlights of the evening. 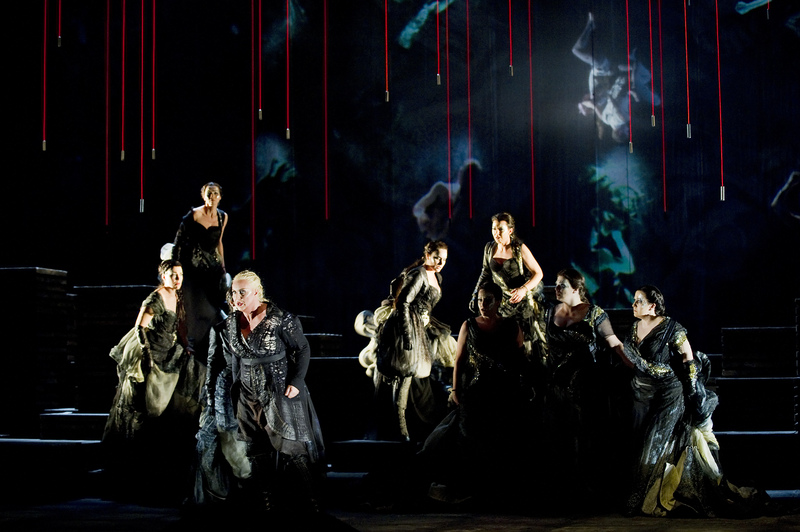 As for the scene between Brünnhilde and Waltraute, sung by Olga Savova, who was Brünnhilde in Walküre, this merely became an ineffective clash of prima donnas. 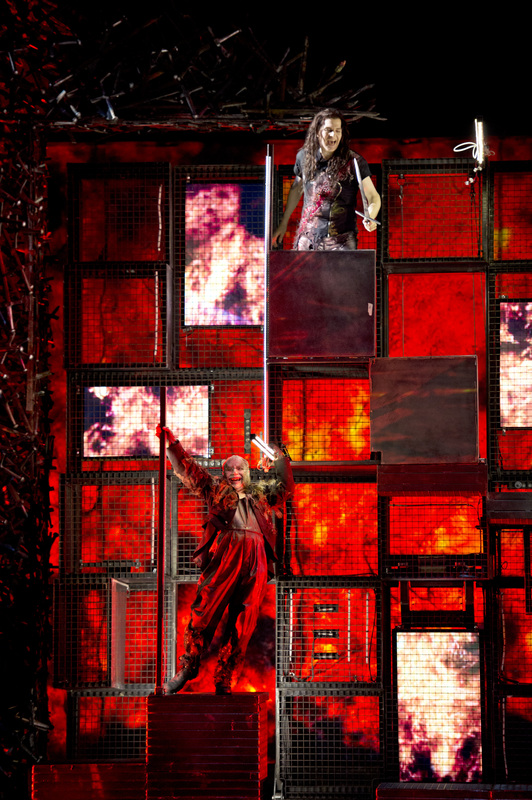 The production itself had some good moments, but there were glitches too. 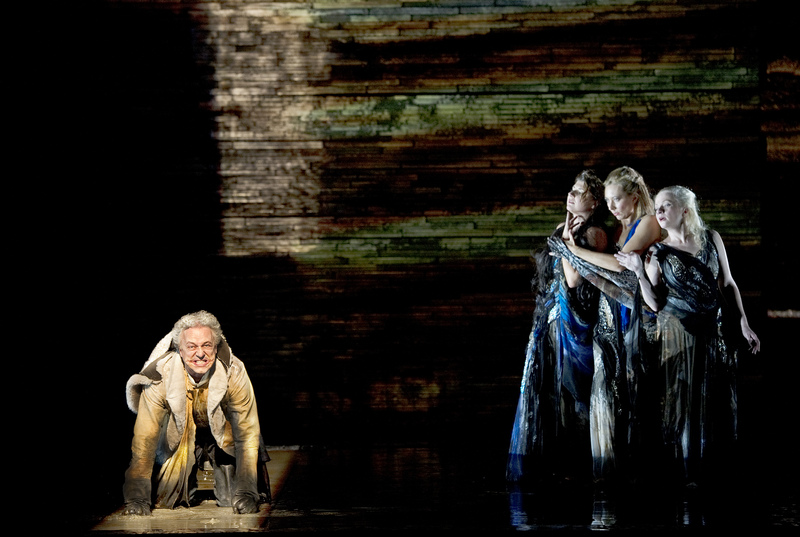 Hagen’s appearance on the roof in the scene where Brünnhilde accuses Siegfried of treachery was very effective, making him seem like the puppet master he is, and his murder of Siegfried during the hunt was very convincing. But when he later goes to the bier to take the ring, Siegfried’s arm did not move, so it was inexplicable that he moved away again. Then at the end when Hagen should sing Zurück vom Ring!, where was he? And why did he not sing? The surtitles showed Away from the Ring! But there were no Rheinmaidens to take it, and no Hagen. With Brünnhilde singing weakly, and nothing happening on stage except for some clever lighting, the ending was disappointing. I’m sure there will be serious criticism of this Maryinsky Ring, and quite rightly too since it failed on many of the high points, but there were wonderful moments, which often don’t come over as well as they did here, and I’m thinking particularly of the scenes with Hagen, Gunther and Gutrune, which were the best I’ve seen. Underlying it all was Gergiev and the orchestra, playing with great sensitivity, and there were some sublime moments, but it did seem that things trailed off a bit towards the end. I loved the lighting, and at least the staging did not insult our intelligence, unlike the recent nonsense in Bayreuth, but the under-rehearsing was most regrettable, considering the unusually expensive Amphitheatre seats. This was a terrific performance, with Sondra Radvanovsky and Roberto Alagna in superb voice as Leonora and Manrico. They could not have been better in this dress rehearsal for a new run of Trovatore, performed in a co-production with the Teatro Real in Madrid by Elijah Moshinsky, with good set designs by Dante Ferretti, costumes by Anne Tilby, and excellent fight sequences by William Hobbs. The orchestra played beautifully under the direction of Carlo Rizzi, and the supporting cast all sang well. Dmitri Hvorostovsky brought a sensitivity to the Count di Luna making him a slightly more sympathetic character than is sometimes the case. This fitted in well with the production, because at the end he stabs Manrico on stage and, told that he’s just killed his brother, holds him in his arms as he dies. Manrico’s surrogate mother, the gypsy Azucena, was well sung by Malgorzata Walewska, making her debut at Covent Garden, and Ferrando was Mikhail Petrenko. Altogether the cast worked well together, and the staging was very effective indeed, but what really put this into the stratosphere was Roberto Alagna as the troubadour Manrico, and Sondra Radvanovsky, whom I also saw as a superb Leonora in Chicago in November 2006.